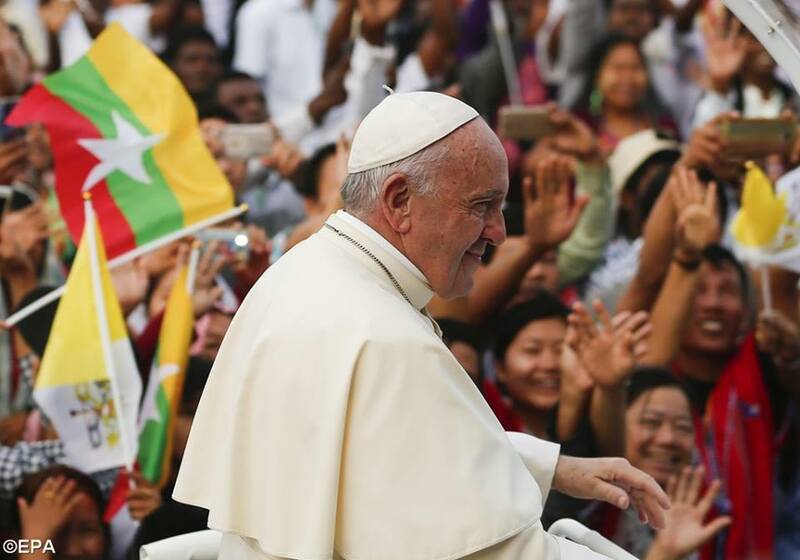 Pope Francis on Wednesday met with the 22 Catholic Bishops of Myanmar in Yangon’s Cathedral Complex. There are 3 Archdioceses and 13 Dioceses Catholic Church in Myanmar. The President of the Catholic Bishops’ Conference of Myanmar is Archbishop Felix Lian Khen Thang. For all of us, this has been a busy day, but also a day of great joy! This morning we celebrated the Eucharist together with the faithful from throughout Myanmar, while this afternoon we met with leaders of the majority Buddhist community. I would like our encounter this evening to be a moment of quiet gratitude for these blessings and for peaceful reflection on the joys and challenges of your ministry as shepherds of Christ’s flock in this country. I thank Bishop Felix [Lian Khen Thang] for his words of greeting in your name and I embrace all of you with great affection in the Lord. I would like to group my own thoughts around three words: healing, accompaniment and prophecy. First, healing. The Gospel we preach is above all a message of healing, reconciliation and peace. Through the blood of Christ’s cross, God has reconciled the world to himself, and has sent us to be messengers of that healing grace. Here in Myanmar, that message has a particular resonance, as this country works to overcome deeply-rooted divisions and to build national unity. For you, whose flocks bear the scars of this conflict and have borne valiant witness to their faith and their ancient traditions, the preaching of the Gospel must not only be a source of consolation and strength, but also a summons to foster unity, charity and healing in the life of this nation. For the unity we share and celebrate is born of diversity. It values people’s differences as a source of mutual enrichment and growth. It invites people to come together in a culture of encounter and solidarity. In your episcopal ministry, may you constantly experience the Lord’s guidance and help in your efforts to foster healing and communion at every level of the Church’s life, so that by their example of forgiveness and reconciling love, God’s holy people can be salt and light for hearts longing for that peace the world cannot give. The Catholic community in Myanmar can be proud of its prophetic witness to love of God and neighbour, as expressed in its outreach to the poor, the disenfranchised, and above all in these days, to the many displaced persons who lie wounded, as it were, by the roadside. I ask you to offer my thanks to all who, like the Good Samaritan, work so generously to bring the balm of healing to these, their neighbours in need, without regard for religion or ethnicity. Your ministry of healing finds particular expression in your commitment to ecumenical dialogue and interreligious cooperation. I pray that your continuing efforts to build bridges of dialogue and to join with the followers of other religions in weaving peaceful relations will bear rich fruit for reconciliation in the life of the nation. The interfaith peace conference held in Yangon last spring was a powerful testimony before the world of the determination of the religions to live in peace and to reject every act of violence and hatred perpetrated in the name of religion. My second word to you this evening is accompaniment. A good shepherd is constantly present to his flock, guiding them as he walks at their side. As I like to say, the shepherd should bear the smell of the sheep. In our time, we are called to be “a Church which goes forth” to bring the light of Christ to every periphery (cf. Evangelii Gaudium, 20). As bishops, your lives and ministry are called to model this spirit of missionary outreach, above all through your regular pastoral visitation of the parishes and communities that make up your local Churches. This is a privileged means for you, as loving fathers, to accompany your priests in their daily efforts to build up the flock in holiness, fidelity and a spirit of service. By God’s grace, the Church in Myanmar has inherited a solid faith and a fervent missionary spirit from the labours of those who brought the Gospel to this land. On this firm foundation, and in a spirit of communion with your priests and religious, continue to imbue the laity with a spirit of true missionary discipleship and seek a wise inculturation of the Gospel message in the daily life and traditions of your local communities. The contribution of catechists is essential in this regard; their formation and enrichment must remain among your chief priorities. Above all, I would ask you to make a special effort to accompany the young. Be concerned for their formation in the sound moral principles that will guide them in confronting the challenges of a rapidly changing world. The next Synod of Bishops will not only address these issues but also directly engage young people, listening to their stories and enlisting them in our common discernment on how best to proclaim the Gospel in the years to come. One of the great blessings of the Church in Myanmar is its young people and, in particular, the number of seminarians and young religious. In the spirit of the Synod, please engage them and support them in their journey of faith, for by their idealism and enthusiasm they are called to be joyful and convincing evangelizers of their contemporaries. My third word to you is prophecy. The Church in Myanmar witnesses daily to the Gospel through its works of education and charity, its defence of human rights, its support for democratic rule. May you enable the Catholic community to continue to play a constructive part in the life of society by making your voices heard on issues of national interest, particularly by insisting on respect for the dignity and rights of all, especially the poorest and the most vulnerable. I am confident that the five-year pastoral strategy that the Church has developed within the larger context of nationbuilding will bear rich fruit for the future not only of your local communities but also of the country as a whole. Here I think in a special way of the need to protect the environment and to ensure a just use of the nation’s rich natural resources for the benefit of future generations. The protection of God’s gift of creation cannot be separated from a sound human and social ecology. Indeed, “genuine care for our relationship with nature is inseparable from fraternity, justice and keeping faith with others” (Laudato Si’, 70). Dear brother bishops, I thank God for this moment of communion and I pray that our presence together will strengthen us in our commitment to be faithful shepherds and servants of the flock that Christ has entrusted to our care. I know that your ministry is demanding and that, together with your priests, you often labour under the heat and the burden of the day (cf. Mt 20:12). I urge you to maintain a balance between your spiritual and physical health, and to show paternal concern for the health of your priests. Above all, I encourage you to grow daily in prayer and in the experience of God’s reconciling love, for that is the basis of your priestly identity, the guarantee of the soundness of your preaching, and the source of the pastoral charity by which you guide God’s people on the path of holiness and truth. With great affection I invoke the Lord’s grace upon you, the clergy and religious, and all the lay faithful of your local Churches. And I ask you, please, not to forget to pray for me.